As I mentioned in a previous post, we signed up for a Community Supported Agriculture (CSA) share, which means we get a grab-box of veggies every week this summer! 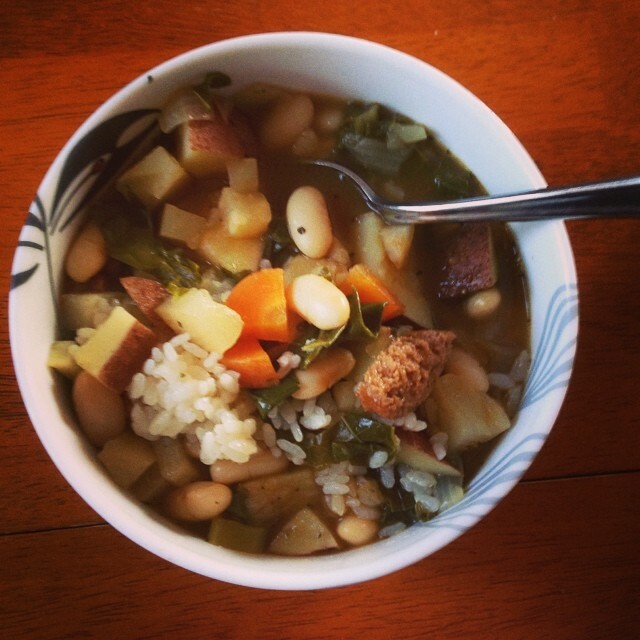 We ate a lot of salad last week, and wanted to mix things up this week with a savory soup! Prep: Finely dice onion and garlic. Cut sausage and remaining vegetables into half-bite-sized pieces. Saute sausage, onion, and garlic until browned. Add broth, kale, and beans. Let simmer for 30 minutes. Add carrots, turnip, celeriac, broccoli, and potatoes. Let simmer for 15 minutes or until all vegetables are tender. Serving Suggestions: over rice or with a slice of bread on the side!